In my home growing up, my mother and grandmother would prepare and serve dairy delicacies for our milchig meal on Shavuos. These included Cheese Blintzes, Cheese Kreplach and Cheese Knaidlach to name a few, and an old-fashioned style cheesecake which I did not appreciate at the time. Being the first in my family to get married, I continued the tradition of making these specialties to serve in my home on Shavuos morning. Subsequently, two of my brother’s got married, and since my mother wanted them to enjoy these foods and could not expect their wives to make them, she started the tradition of making the blintzes and kreplach for all of us for Yom Tov. And the cheesecake! Being in the cheesecake business does not exclude me from getting my own pan of (unbaked) cheesecake, made with the traditional dough on the bottom and dough on top with a farmer’s cheese filling. Yum! In the past several years, my mother has been preparing these items with my help in my home, so I can appreciate how much time it takes to cook it and pack it up for the individual families. 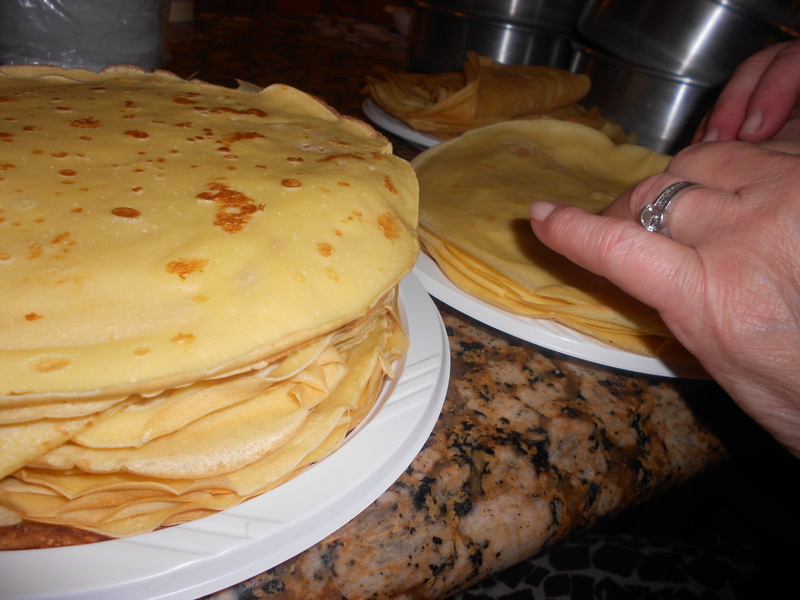 Yesterday my mother came over and single-handedly made 80 crepes (still not enough!) and filled them. 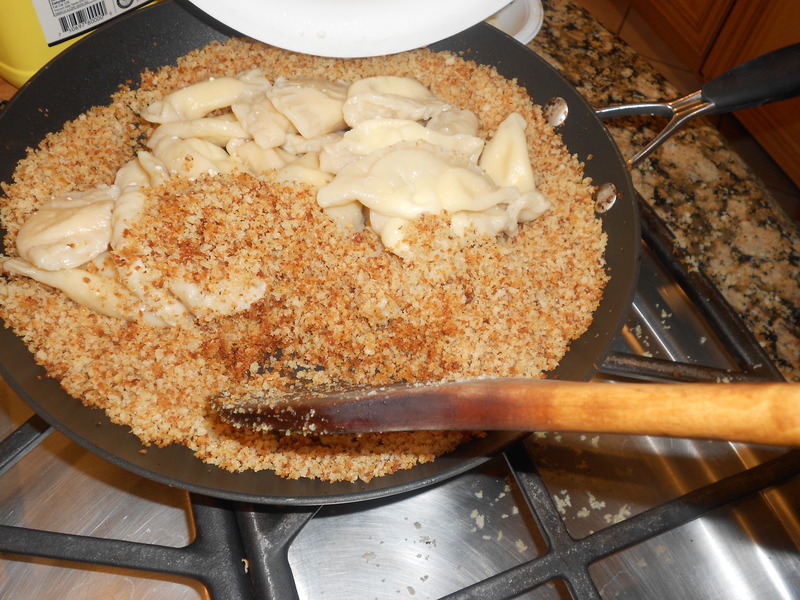 With the help of my daughter-in-law and 10-year-old son, dough was rolled out, filled and sealed for approx 180 kreplach, after which my mother cooked them in gently boiling water, drained them and bathed them in breadcrumbs toasted in butter. 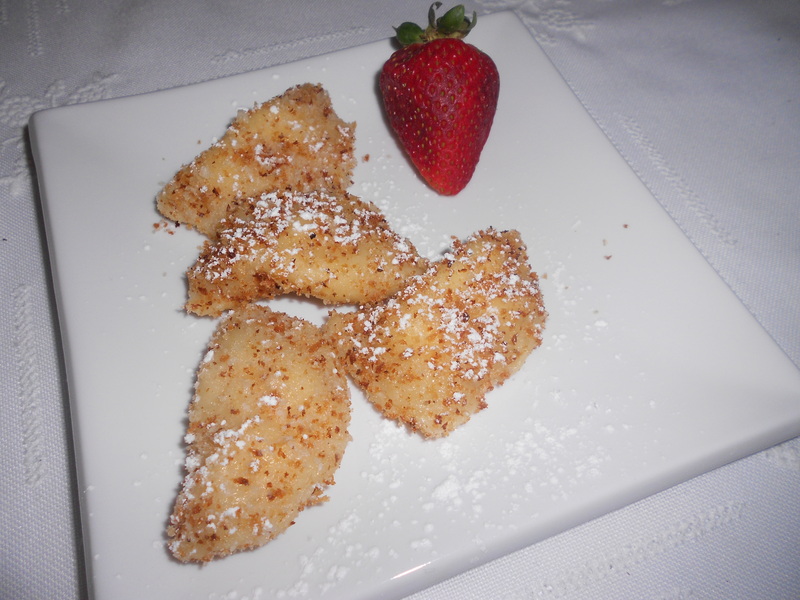 Serve with a sprinkling of confectionary sugar either as a dessert or as an entrée, perhaps accompanied by a blintz, a dollop of sour cream and a fresh strawberry. Ahhh…..
Are you wondering what I did yesterday as everyone around me was put to work? As a matter of fact, I was taking pictures for this blog post and I made the blintze filling, kreplach filling, and the dough for the cheesecakes. All in all, we spent hours in the kitchen together, bonding – mothers, grandmothers, daughter and daughter-in-law, and lets not forget the sons and son-in-law – some helping and some watching and tasting. What a great way to spend a Sunday afternoon! This recipe is from The Haimishe Kitchen, volume 1. It makes approximately 16-18 small crepes. For crepes, mix together flour and eggs. Stir until no lumps remain. Add remaining ingredients slowly. You may need an immersion blender to make it smooth. Heat frying pan, brush with oil or butter. With a ladle, pour some batter into the pan while tilting and swirling it to make a thin layer. When the underside is brown, turn to brown the other side. Crepes should be soft and pliable. Pile them one of top of the other until you are done and are ready to fill them. For the filling, mix all ingredients together. 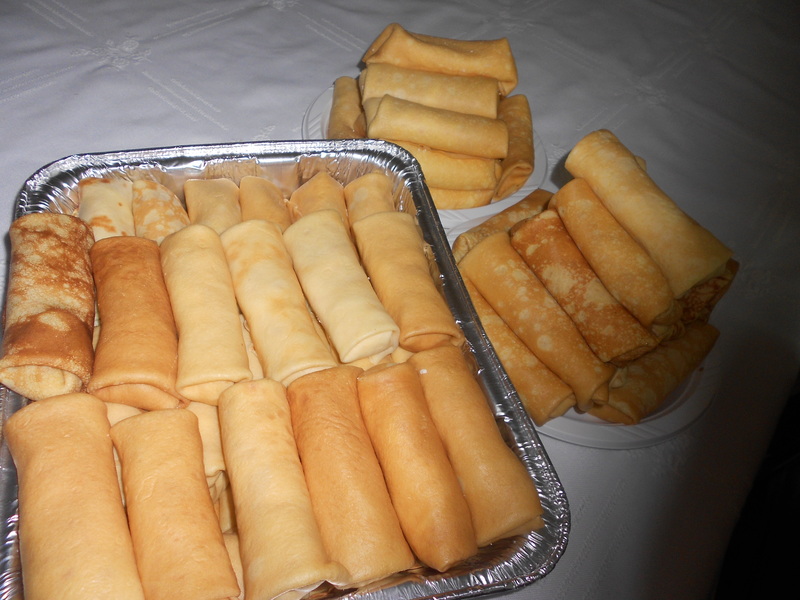 Fill and roll blintzes. Note: The blintze filling is not overly sweet, because too much sugar will make for the filling liquid and it will ooze out. If you prefer a sweeter blintze, top with confectionary sugar (and sour cream ;)). 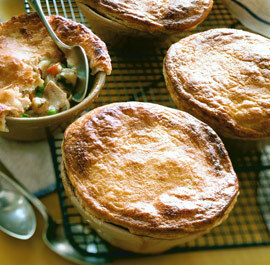 Serve warm by reheating covered in an oven or in a single layer in a pan with melted butter. This recipe was given to me by a customer that asked me to make them for her. They are soft and delicious. Do not reroll the extra dough, as it will be tough. 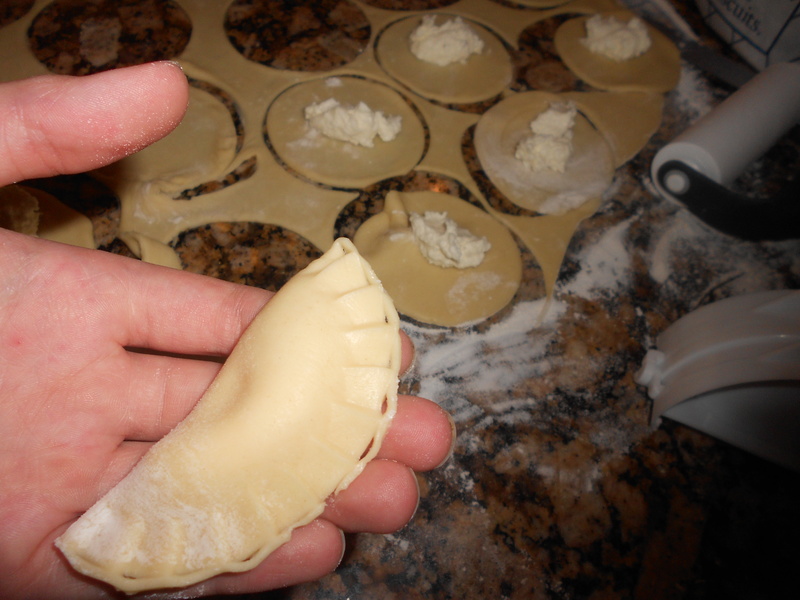 This recipe will yield approximately 60 kreplach. 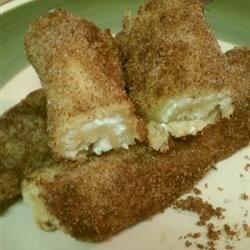 *note: sugar makes the cheese soft causing a loose texture, so put in the smallest amount that it needs to taste good. Then a bit of confectionary sugar on top should put on the finishing touch of sweetness. Mix all ingredients together for the dough. Let stand at room temp for 2 hours. If it is too soft to roll, refrigerate for 1/2 hour or more. Heat a pot of water to a gentle boil. Add a bit of salt to the water. In a frying pan, melt 1/2 stick of butter. Add breadcrumbs and a bit of sugar and toast till it’s a nice light brown color. My mother likes to make her own breadcrumbs, so the pieces are not too fine. I bought the panko crumbs (not the orange ones), but you can use any unflavored, store-bought breadcrumbs. Roll out dough to 1/16″ thickness. Cut dough into 2 -3″ rounds with a cookie cutter. Spoon a bit of filling in the center of each round. Fold in half and seal with a fork or with your fingers. When you have several of them ready, gently drop into pot of water. Cook for a few minutes. 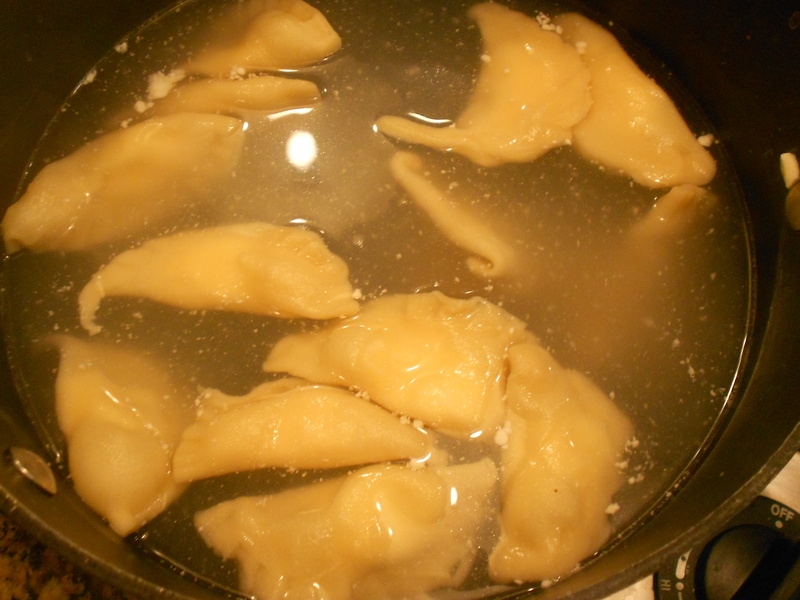 Remove kreplach from the water and place in a strainer or colander. 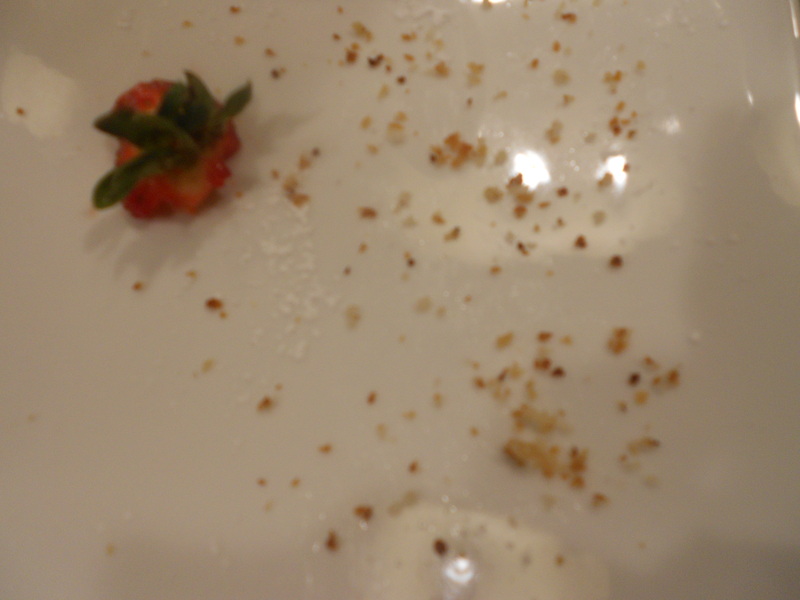 When drained, toss in the breadcrumb mixture. Serve warm with a bit of conf. sugar on top. How many times have you tried a recipe from a cookbook or magazine and when you wanted to make it again, could not find the publication you got it from, or better yet, could not remember which publication you got it from?? I get several food magazines monthly plus the weekly Mishpacha and Ami Magazines. If a recipe looks interesting, I fold the page in half indicating I would like to try it, but mostly I never get to them (there are so many!). When I try out and like a recipe, my best bet is to copy it onto this blog, not only to share my experience with you, but also to serve as a personal recipe book so I can easily find the recipes worth making again! This is based on a recipe from Zehava Krohn in the Ami Living. 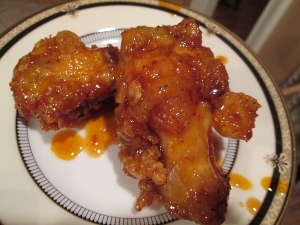 I loved the consistency of the sauce and how beautifully it glazed the chicken. I used a hot sauce which I found in the sushi section of my supermarket and it was so hot, I had to triple the recipe (without adding hot sauce) to make it edible. Later, my kids told me that it is an overly hot sauce! Preheat oven to 400 degrees (if you are serving it today). Toss drumettes with olive oil and seasoning. If you have a good eye for these things, you do not need to measure the spices, just sprinkle. Heat oil for frying in a medium saucepan. In a small bowl, combine flour and seasoning. Dredge drumettes in the flour. When oil is hot, drop drumettes into the oil and fry on both sides until outside is golden and crisp, about 8 to 10 minutes. You do not need to worry if they are cooked through because it will continue cooking in the oven. Drain chicken on a paper towel-lined plate. In a small saucepan over medium heat, melt the margarine. Stir in the honey, hot sauce, brown sugar, ketchup, and vinegar. Cook for 7-10 minutes, until sauce thickens a bit. Stir in dissolved cornstarch. Dip drumettes into the sauce and place in an aluminum baking pan. You may freeze at this point but if you are serving them soon, bake for 8-10 minutes in the preheated oven. Some words just make your mouth water – and cookie dough is one of them! This cake won first prize in a contest years ago and with good reason! I already decided that this will be the cheesecake I serve my guests this Shavuos. Well, maybe one of the cheesecakes…. You see, my friends Shirley and Chaim Cohen eat by us the first night of Shavuos each year. Every year when I invite Shirley, I tell her that I don’t know if and what we’ll eat because I don’t know when I’ll have time to cook, and she always answers me with a laugh “that’s OK, we’ll have 4 courses of cheesecake!” And she’s not joking – it’s my family that would have an issue with that….. In a small bowl, combine cookie crumbs and sugar; stir in butter. Press onto the bottom and 1 in up the sides of a greased 9-in. pan. Place pan on a baking sheet; set aside. In a large bowl, beat cream cheese and sugar until smooth. Beat in sour cream and vanilla. Add eggs; beat on low speed just until combined. Pour over crust; set aside. In another bowl, cream butter and sugars until light and fluffy. Add water and vanilla. Gradually add flour and mix well. Stir in 1 cup chocolate chips. Drop dough by teaspoonfuls over filling, gently pushing dough below surface (dough should be completely covered by filling). Place pan on a baking sheet. Bake at 350° for 45-55 minutes or until center is almost set. Cool on a wire rack for 10 minutes. Carefully run a knife around edge of pan to loosen; cool 1 hour longer. Refrigerate overnight. Remove sides of pan. Sprinkle with remaining chips. Refrigerate leftovers. Nutrition Facts: (do you really want to know??) 1 slice equals 551 calories, 36 g fat (22 g saturated fat), 131 mg cholesterol, 328 mg sodium, 52 g carbohydrate, 2 g fiber, 8 g protein. Someone recently asked me if I have any cheesecake recipes to share for an upcoming publication. I said they could take anything off my website, but she said there wasn’t much there. What???? I checked and she was right! I guess the Shavuos/cheesecake season with late nights and long work hours, doesn’t leave much time for blog writing! I am trying to rectify the situation, and you’re all welcome to share your favorite recipes here as well. Who doesn’t like the Neopolitan ice cream combination? Not only does it look enticing, the flavors are familiar and comforting. This cake has won awards and ribbons around the country. The recipe called for a 9-inch springform pan but I think it is more impressive in the 8-inch because the layers won’t be so flat. You can choose between the two. Happy Baking!! 1. Combine crumbs and 3 tablespoons of butter; press onto the bottom of an ungreased 8-in. springform pan or one piece cheesecake pan. Bake at 350 degrees for 8 minutes; Cool. for 1-2 minutes to get them melted); stir into one portion of the batter. Spread dark chocolate mixture evenly over crust. Freeze pan for 1 hour before proceeding. 4. 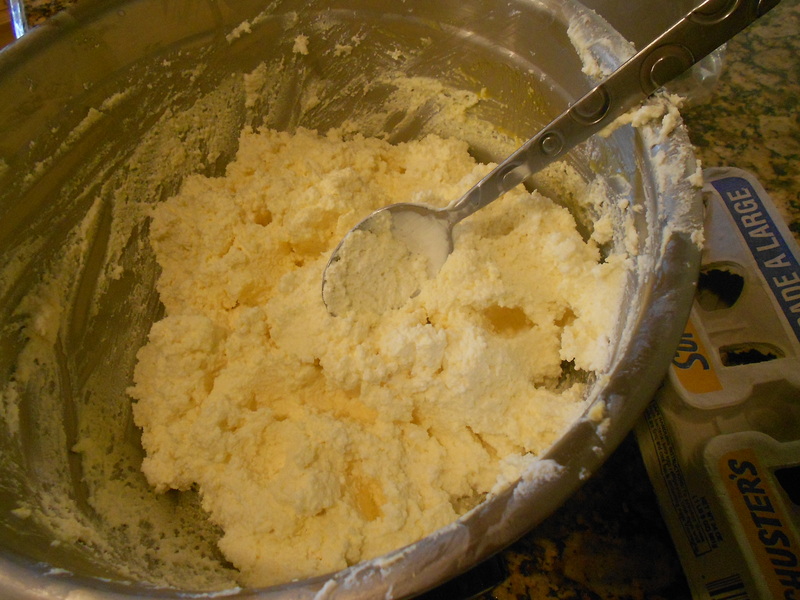 Melt 2 ounces of white chocolate; stir into second portion. Carefully spoon this layer on top of the dark chocolate layer. Freeze for 20 minutes before proceeding. 5. Stir strawberries into the remaining batter. Carefully spoon it on top of the previous 2 layers. 6. Bake cheesecake on the lowest shelf in the oven, in a water bath, at 325 degrees for approximately 1 hour and 10 minutes. The center of the cake should jiggle. It will set as it cools. If the cake is no longer frozen when it goes in the oven, you can bake it on the 2nd to bottom shelf in the oven. 7. Remove from oven. Cool for several hours or overnight. 8. Run a knife around edge of pan and remove cake from pan. 9. Melt remaining semisweet chocolate, remaining butter and 1 teaspoon of shortening; cool for 2 minutes. Pour over cake. (note: this amount of chocolate will only coat the top of the cake). 10. Melt remaining white chocolate and shortening then drizzle over glaze. 11. Refrigerate until cold before serving. At any given time, I usually have baggies of challah stuffing in my freezer. I use them to stuff chicken capons, veal breast pockets, and deboned chicken drumsticks. On Pesach, when I serve my holiday delicacies, I like to have matzah stuffing as a stand-in for my traditional stuffing. Cook onions, celery, and carrots in oil until they begin to brown 8-10 minutes. Run water over matzah until softened. Drain water by squeezing matzah between the palm of your hands. Add 1/2 of the vegetable and the eggs, parsely and spices. This recipe is enough to stuff 4 cornish hens or 1 veal breast pocket. When the newest issue of Fine Cooking arrived at my door, I was amazed at all the Rosh Hashana/Sukkos appropriate recipes. The chocolate honey cake sounded intruiging. Although I’m not a huge fan of honey cake in general, I think I like chocolate cake in any form, so I gave it a try. It is large (10-inch) and impressive. I can’t wait to present it at the meal and to sample it! The combination of natural and Dutch-processed cocoa powder, coffee, and mild honey gives this cake an incredibly moist texture and an intense, complex, and very grown-up chocolate flavor. Making the cake layers ahead allows the flavors to develop, and making the ganache ahead gives it time to firm up to the perfect texture for spreading. Spray two 10-inch round cake pans (with at least 2-inch sides) with cooking spray and line the bottom of each with parchment. Sift both cocoa powders into a medium bowl. Whisk in the coffee and then the honey. Let cool completely. Sift the flour, baking powder, baking soda, and salt into a medium bowl. In a stand mixer fitted with the paddle attachment, beat the butter on medium speed. Gradually add the oil, beating until combined. Add the brown sugar and granulated sugar. Raise the mixer speed to high and beat until light and fluffy, about 3 minutes. Add the eggs one at a time, beating well on medium-high speed after each addition. Add the sour cream and vanilla, beating just until combined. With the mixer on low, alternately add the flour mixture in three additions and the cocoa mixture in two additions, beginning and ending with the flour (scrape down the sides of the bowl as necessary). Beat just until combined. 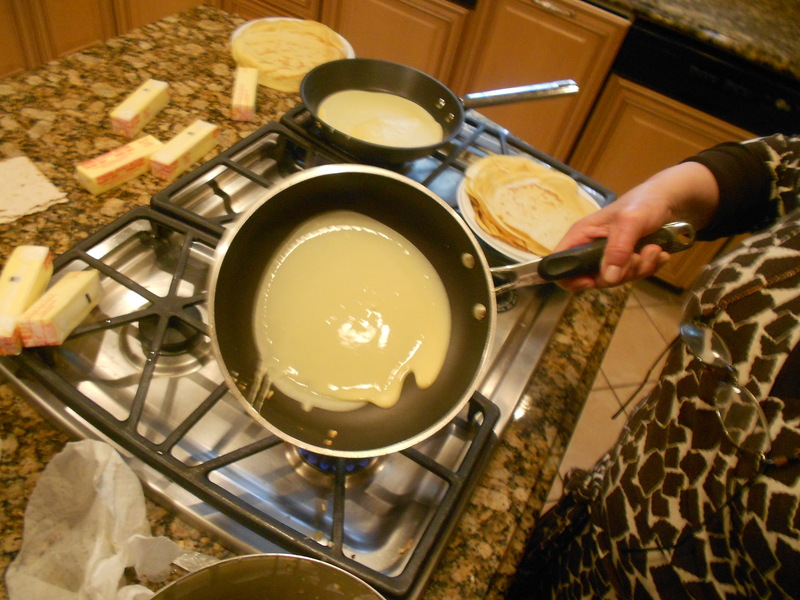 Divide the batter between the two pans, using an offset spatula to spread it evenly. Tap the pans once or twice on the counter to settle the batter. Bake, rotating the pans halfway through, until a wooden skewer inserted in the center of each cake comes out with only a few moist crumbs clinging to it, 40 to 50 minutes. 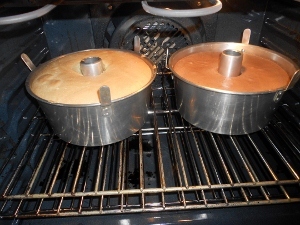 Cool the cakes in their pans on a rack for 10 to 15 minutes. Run a knife along the sides of the pans, invert the cakes onto the rack, and remove the pans and the parchment. Let cool completely. Put the chocolate in a large heatproof bowl. Frost the cakeSet one of the cake layers on a serving plate. Spread about 1 cup ganache over the surface of the cake. Top with the second cake layer and spread a very thin layer of ganache over the top and sides of the cake to seal in any crumbs. Refrigerate for 5 to 10 minutes to allow the crumb coat to set. Spread the remaining ganache evenly over the top and sides of the cake. Make the chocolate curlsTo decorate the cake with chocolate curls, if using, soften the chocolate in the microwave on high power for 30 to 50 seconds. Scrape a vegetable peeler firmly down one side of the chocolate block to form thick curls. Put the curls on a plate and refrigerate until they’re firm enough to handle. Scatter over the top of the frosted cake. 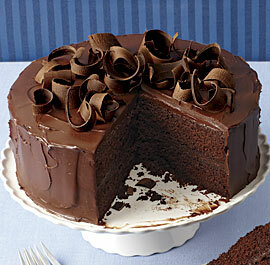 For the best spreading texture, the ganache should be made 8 to 24 hours ahead. Keep covered at room temperature. For the best flavor and texture, the cake should be made at least 1 day before serving. To store at room temperature, wrap each completely cooled layer tightly in 2 layers of plastic wrap and store for up to 2 days. Up to 10 hours before serving, fill and frost the cake. 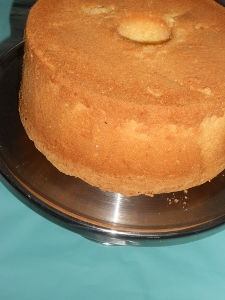 Keep the cake at room temperature, covered with a dome, until ready to serve. The cake layers can be frozen for up to 2 weeks: Transfer each completely cooled unfrosted layer to a 10-inch cardboard cake round and wrap tightly in 2 layers of plastic wrap, then in foil, and freeze. Up to 15 hours before serving, remove the foil but not the plastic wrap from the cake layers and thaw at room temperature. When completely thawed, unwrap, fill, and frost the cake. If you plan to travel with this cake, it’s easier to transport if it’s refrigerated, uncovered, until the ganache is firm. 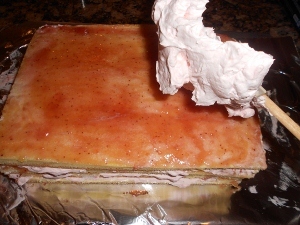 To aid transport, assemble the cake on a cardboard cake round and transfer it to a covered cake carrier once it’s firm. When you arrive at your destination, put the cake on a serving plate and allow it to come to room temperature before slicing.